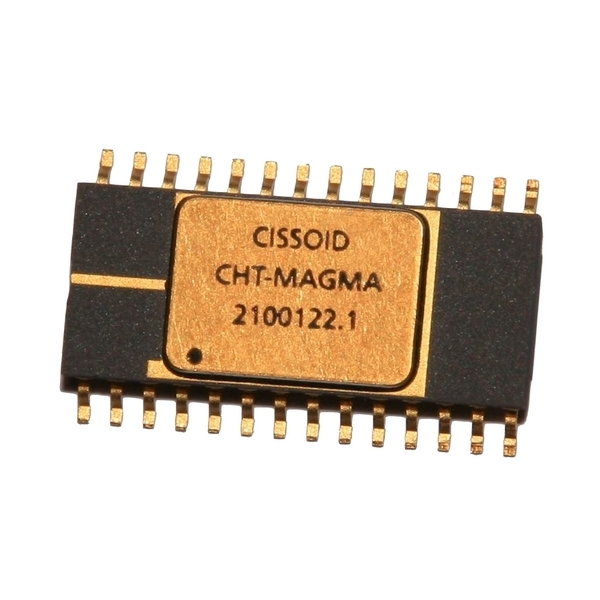 MAGMA is a high temperature Pulse Width Modulation (PWM) Controller. It operates at constant frequency, adjustable from 50KHz up to 500KHz. MAGMA can operate with input voltages from 6 to 30V. It also features an internal voltage reference, input feed forward compensation making it less sensitive to input voltage variations, and a soft start activated whenever MAGMA comes out of stand-by or the output is enabled. An under-voltage lockout function maintains the PWM output low until the controller has sufficient supply voltage for proper operation. A “power good” comparator returns a “good” signal when the DC-DC converter output voltage has reached a programmable threshold. A synchronization pin can be driven by an external clock while the internal clock is available on CKOUT pin. DC-DC Converters in Oil&Gas, Industrial, Aerospace & Automotive. EVK-VESUVIO, a High Temperature, High Efficiency Step-down DC-DC, up to 50W. EVK-EREBUS, a High Temperature, High Efficiency Step-down DC-DC, up to 280W. EVK-STROMBOLI, a High Temperature, High Efficiency isolated DC-DC (Flyback), up to 50W/150W. EVK-FUJI , a High Temperature non-isolated DC-DC (Flyback), with triple output: up to 2W, board size=3x1 inch². Application: Buck DC-DC converter based on MAGMA PWM controller.